Gulliver's, the operators of theme parks in Warrington, Matlock Bath and Milton Keynes, is clearing the last planning hurdles for its proposed £37m leisure resort in Rotherham. The application was not called in by the Government but is subject to a number of conditions. The family-owned firm is hoping to satisfy some of these by submitting further details to the Council. 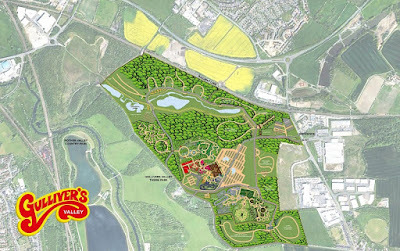 The proposals, which will create around 400 jobs, are for a year round destination aimed at 2 - 13 year olds include a theme park hub, woodland adventure centre, ecology and education centre, lodges, hotels and a holiday village. The scheme is expected to be built over 12 - 15 years in a number of phases. Phase one includes the main Gulliver's theme park with three themed areas, the entrance hub and castle, and is set to open in 2020. Updated documents for Council officers to sign off include an ecological mitigation, enhancement and management plan, a travel plan, proposals for the "softworks" around the site and an assessment of the mineworkings in the area. Gulliver's is purchasing around 250 acres of the restored former colliery and opencast site from Rotherham Council. The assessment by Wardell Armstrong looks at previous mine shafts in the area, and the subsequent opencast workings, and conclude that "construction can proceed as presently proposed." Mitigation measures are outlined for safeguarding habitats, during the construction phase and during the operation of the theme park. A range of enhancements will also be incorporated into the permitted scheme. The overall site is approximately 98 hectares in area comprising the northern part of the Rother Valley Country Park. 215,000 sq ft of buildings are proposed and the proposed vehicular access comprises a new site access junction off the A618 Mansfield Road. The resort is set to have 1,728 car parking spaces with space for electric vehicles, coaches and cycles. It is anticipated to attract 21,000 to 25,000 visitors per week during the peak season and 1,000 visitors per week during the remainder of the year (apart from special events including Bonfire Night and Christmas). The normal opening hours would be 10.30 to 17.00. The updated travel plan, drawn up by SYSTRA Ltd, looks at access to the site. For example, public rights of way have been incorporated within the scheme without the need for diversions. A number of courtesy footpaths have also been included which will be available for use during daylight hours. The plans state: "Travel to and from the site will be encouraged by public transport modes and active modes as far as possible. However, it must be recognised that the target demographic for the development is families with young children. Walking or cycling more than short distances is very challenging for such family groupings." Gulliver's plan to hold discussions with existing bus operators as to the feasibility of operating a bus service into the site. Marketing and promoting sustainable transport methods makes up much of the travel plan. The site layout is designed to encourage and promote walking and cycling and as the site develops, a cycle hire centre and electric land train are planned to help movement on-site.